Includes exclusive bonus audio of the voice of the Dalai Lama as coauthor Franz Alt asks about his views on President Trump, the rise of nationalism, the refugee crisis, the climate catastrophe, and more. In this brief, urgent 'appeal to the world,' His Holiness the Dalai Lama addresses our time of division, calling on us to draw upon the innate goodness of our shared humanity to overcome the rancor, mistrust, and divisiveness that threaten world peace and sustainability. 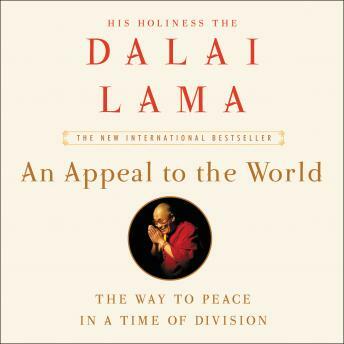 Already a major international bestseller, now available in English for the first time: In An Appeal to the World, His Holiness the 14th Dalai Lama of Tibet illuminates the way to peace in our time, arguing for a form of universal ethics that goes beyond religion—values we all share as humans that can help us create unity and peace to heal our world. 'All people are united in the pursuit of happiness and the desire to avoid suffering,' His Holiness reminds us. 'This is the source of humanity’s greatest achievements.' Our development relies on cooperation, not competition. We need to begin to think and act on 'we humans'—we must stop focusing on what divides us and recognize our commonalities. Without secular ethics—what Albert Schweitzer referred to as 'reverence for life'—we cannot solve all the problems we face. Working with trusted collaborator Franz Alt, the Dalai Lama calls on the better angels of our nature to tackle a wide range of contemporary issues, from war, violence, and intolerance to climate change, global hunger, and materialism. Applying the techniques and teachings of Tibetan Buddhism—from listening and contemplation to meditation and nonviolence—His Holiness provides a roadmap forward.